I attended a Radiohead show a couple of weeks ago at Great Woods, and the uniqueness of the show that they put on struck me immediately. There really is no band around that sounds like these boys from Manchester. The vibe the band created in the venue that night was intensely otherworldly and intimate. I would describe it as breakbeat-fuzz-guitar-trance. Thom was decked in tight red jeans, and danced and raved onstage like an angelic, melodically inclined alien with something to prove. 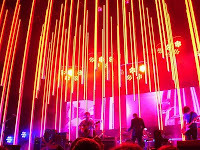 The fantastic light show, comprised of futuristic LED light sticks suspended above the band's head, accented and perfectly complemented the surreal soundscape of Radiohead's patented ambient show. At the best moments, the band's spacious sound and Thom Yorke's pixie falsetto combined with the intensely colorful light show to induce a trance-like, space-ship bliss-out. At one moment I felt as if I was experiencing the final scene of the film Close Encounters of the Third Kind, where Thom was the alien, extending a sad, yet euphoric offering of music to us Americans. After tonight's show, it leads me to believe that Manchester, UK might as well be another planet relative to New England, as the musical realm that Radiohead lives in is truly a foreign place to us. Thom Yorke commands attention. The crowd was not talkative, as Thom Yorke's delicate performance demanded an intimacy from all who were present. His falsetto pipes really act as an instrument that is essential to the band's sound. There were times in the show when he played the role of a theramin, sliding up and down the upper register in his own haunting tone. At its most delicate and gentle, his voice quieted the entire amphitheater of people. At his most jubilant, Yorke was a trance-induced shaman, chanting and gasping his voice to drive the breakbeat rhythm forward. Johnny Greenwood proved to be a master of nuisance and atmospheres, and played the role of creating soundscapes all night, switching between guitar, pedals, and keyboards. The band's excellent setlist choice showcased songs from every album, with no songs from OK Computer played until at least 40 minutes into the set. The band delivered what seemed like endless encores, and with the show peaking in the last minute to a Technicolor static light show, Yorke chanted the band to a climax with an abrupt, grinding halt. Always leave them wanting more. With Radiohead's performance, we were more than happy to get what we got, as it seemed like the band gave us their all.